Partners is a series of three six month artist residencies in an area of Aberdeen facing regeneration – Middlefield, Tillydrone and Woodside. The three residencies, with artists Eva Merz, Dave Rushton, and Roger and Reid, started in November 2006 and will run until Summer 2008. The project aims to involve people who have not previously participated in the arts in collaborative projects, addressing issues relevant to their lives, in particular in relation to the regeneration of their areas. 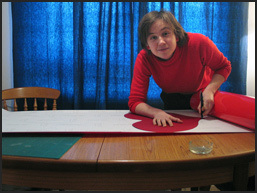 The project is funded through the Scottish Arts Council and Aberdeen City Council. Peacock Visual Arts partner is Station House Media Unit, a community media centre in the area, which is part of the Aberdeen City Council arts education team. I arrived at Peacock Visual Arts in November 2004 as curator. 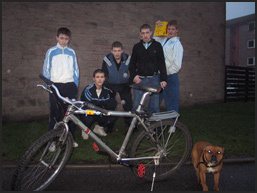 At the time a residency scheme called Locale was underway. This scheme was based on a new artistic policy at the institution which has a socially engaged focus, aiming to involve ‘artists and others in issues relevant to them’.’ In December 2004 we applied to the Scottish Arts Council for funding for the Partners scheme. The next months were spent on consolidating a steering group for the project, involving people from the two partner organisations (Peacock Visual Arts, Station House Media Unit) and local people from the areas of the residency. This process proofed to be a complex and challenging one and the group only recruited artists in September 2006 for a start in November 2006. Aberdeen-based Danish artist Eva Merz, founder of the open, collective project New Social Art School moved into a council flat in Tillydrone in November 2006. The first months were spent getting to know the area and meeting people, from staff and participants at Station House, to councillors, community centres, users of the centres and local residents. She decided to concentrate on Tillydrone, as she discovered that areas are quite distinct and the project needed greater focus. Eva Merz has been photographing the area and quickly focused on signs put up by the council, which feature a variety of interdictions from ‘No Ball Games’ to ‘No Exercising Pets’. While Eva also began to identify many other issues, the signs became the focus of the project. In addition she has been taking photographs of all people who visit her flat. While contact with people working in organisations in the area was easily established it proved extremelly difficult to approach locals more informally. 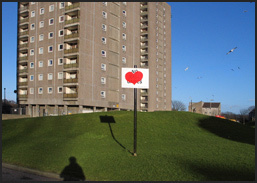 To begin to communicate with residents and to highlight the presence of the signs, Eva and some helpers covered the signs with red vinyl hearts on Valentine’s day. This initial action had an overwhelmingly positive response and has formed the basis for further meetings, such as one with young mothers in the coming weeks.